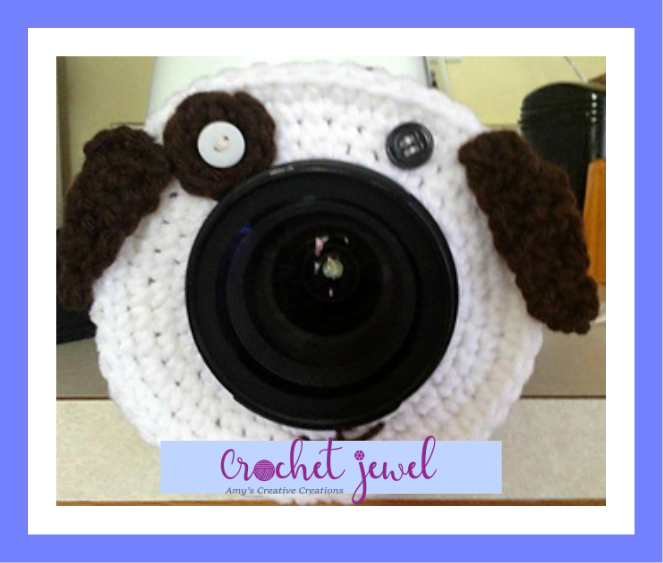 I saw this Crochet Camera friend online and I thought it would be so cute to make for my daughter when I take her picture. So I create this camera pal. She is pretty good about me taking her picture, but I thought this camera pal would make her smile even bigger. It's so cute to see her try to figure out whats on the camera, but it really does get her attention when I take her picture. Start with the pony tail holder, you may not need as many sc around depending on how big your pony tail holder and how big your lens is. I used a Nikon Camera lens. work 2sc in each stitch around, sl st. -10sc, fasten off. Then sew one button on top of the eye circle, and sew one button next to the circle about 1 inch apart, seen above in the picture. Rnd 5. ch 1, hdc in the next two stitches, -2hdc, Fasten off. Sew the ear on next to the eyes on both sides. see above in the picture. When you are done, place the Camera pal around the lens of your camera and you are done!